Please join me at the Bear Hotel in Woodstock on Wednesday 30 October for a discussion on contemporary art. The evening will begin with a viewing of a short documentaries featuring American pop artist, Jeff Koons, followed by a panel-led discussion with the audience about issues concerning contemporary art and the artists featured in the documentaries. This promises to be an evening of lively discussion and energized debate. For information about the Art in Woodstock Festival and directions, please visit their website: http://artinwoodstock.com/page/Find_us. 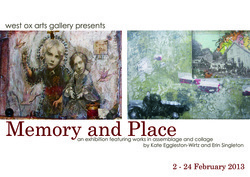 West Ox Arts presents Memory and Place, an exhibition featuring collage and assemblage by Kate Eggleston-Wirtz and Erin Singleton. Finding their inspiration in history, memories, and storytelling these American-born artists use a combination of mixed media, discarded items, and found objects to create intriguing, tactile collages and assemblages that offer a unique perspective of their individual journeys as they’ve adapted to life in the UK. Curious, humorous, and mysterious, these dreamlike works capture moments lost in time – symbolic stories about memory and place. If you're looking for unique, thoughtful gifts to gived to your friends and loved ones this Christmas, look no further than the Christmas Craft Exhibition & Sale at the West Ox Arts Gallery in Bampton, Oxfordshire. I've been joined by 19 artists or this fantastic exhibition, where I have a variety of products available starting at just £4.50! Support artists & makers: Buy unique. Shop local. Visit Woodstock Oxfordshire between 27 October - 4 November and fill your boots with art & culture! Don't forget to look out for Bohemian Pearl - I'll be there with bells & whistles on! Details at www.artinwoodstock.com. My work is currently being featured alongside that of other artists for this group exhibition, which is being held at the Saïd Business School, Park End Street, Oxford OX1 1HP. The gallery (ground floor on the right side of the Saïd building) is usually open daily from 10am - 4pm, but it is ccassionally possible that the space may be in use by the Business School for other purposes, sometimes at short notice, so please ring 01865 288800 to check before visiting. I am featuring vintage prints and hand painted wall hangings ranging in price from £8.50 - 63 at the Portwell Angel in Faringdon through the month of September. The Portwell is a great place for a spot of lunch, a casual drink or dinner. They also feature live music and other entertainment. Stop by for culture fix! In these workshops I'll show you the process I use when making my vintage wall hangings. I'll guide you through the process as you make your own mini vintage print or pendant. There's no need to book in advance, just drop in anytime between 2.30 - 4.30pm. Feel free to bring a friend! If you've never been to Bampton, you should! While you're there you can visit me in the Vesey Room Gallery for a cuppa brew and see the vintage-inspired art, home decor & jewellery I'll have on display throughout the month of August. All of the work will be available for sale at prices that will make you smile! During the exhibition, I'll be hosting a couple of drop-in workshops and artist demos so you can see exactly what goes into making a Bohemian Pearl creation! Be sure to join me for light drinks and nibbles at the Opening Reception on Saturday 4 August from 1 - 5pm.